Aston Martin has produced its fair share of desirable and iconic cars over the last 103 years. So picking a top five is no easy task. Carphile.co.uk pick five of our favourite Aston Martin Classics. From a future classic to a bona fide legend, the most famous car of all time and the most expensive British car ever to be sold at auction. When the DB4 GT Zagato was launched in 1960, it was still possible to drive to the circuit, change into your race suit and go out and win. 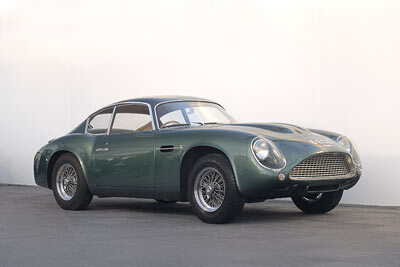 The DB4 Zagato was built to challenge the might of Ferrari in sports car racing. A development of the DB4 GT, but with lightened bodywork styled and built by Italian design house Zagato. Now the DB4GT was no slouch but the DB4 Zagato was intended to take this even further. Built on a shortened DB4 chassis, thinner body panels, racing seats and a few deleted luxuries shaved 70kg from the DB4 GT’s 1277kg weight. DB4GT heraldry mixed with Zagato wizardry were always going to deliver something special but when mixed with rarity as well… Only 19 GT Zagatos were originally made, although four more “Sanction 2” cars were built in 1991 and a further two Sanction III cars in 2000 and it should come as no surprise that the DB4 GT Zagato is among the most sought-after and valuable cars in the world. Costing £5,470 when new (equivalent of about £109,000 today), a DB4 GT Zagato was sold at RM Sotheby’s Driven by Disruption event in New York, December 2015, for £9,450,000. Setting a new record for the most expensive British car ever sold at auction in the process. That the car fell short of really challenging Ferrari on track really hardly matters. This pin-up is not only (arguably) the most desirable Aston Martin of all time but also one of the most desirable sports cars ever made…period. Game changers often have to carve new paths and that path isn’t always the easiest. 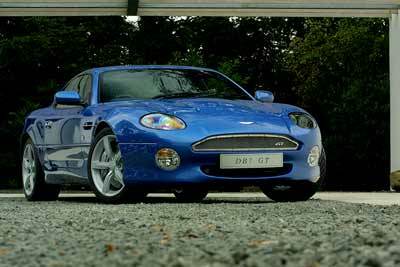 Which brings us to the Aston Martin DB7. Launched back in 1993 and now, over 20 years after the car first entered production, it’s still really rather beautiful isn’t it? But beneath those looks, the DB7 shouldered a heavy burden and concealed something of a dirty secret. The burden was to turn a decent profit and convince Aston Martin’s (then) new owners Ford that the company was worthy of further investment. The secret? Under the skin the car’s lineage owed rather more to Jaguar than Aston Martin and Aston purists didn’t like that one bit. The rest is history. The DB7 was a huge success, remaining in production for 11 years and selling in numbers no Aston had before, leading to the investment in a new factory and modern platform that underpins all modern Aston Martin cars today. DB7 ownership starts with the early six cylinder cars. Prices for good early DB7’s start at around £25,000, with prices for the more powerful 420bhp V12 Vantage starting around the £30,000 mark. Collectors will probably look towards one of the 99 coupes (DB7 Zagato) or 99 convertibles (AR1) Zagato produced or the final, more powerful and very desirable, DB7 GT (pictured). N stands for Nurburgring, 430 for 430bhp and The Aston Martin N430 is a special edition of the Vantage sports car launched in 2014 to celebrate the marque’s on-track success in the gruelling Nurburgring 24 hour race (winning on it’s debut in 2009 no less). Based on the V8 Vantage S, so you get the sharper steering and more aggressive suspension settings and with the choice of either six speed manual or 7 speed automated manual transmission. Inside you’ll find carbon-fibre and kevlar bucket seats in place of the standard items that shed 20kg of weight. With the N430 Aston Martin sought to bring some of the excitement from the track to the road. In-keeping with the motor sport, the N430 is available in a range of five different liveries all inspired by racing Aston Martins from the past. There’s always a danger with entry level models in that they offer up a taster to something better up the range. This has never been the case with the V8 Vantage, a car with the character, style and performance to hold its own in the Aston Martin range. So in over a decade of Vantage production the N430 offers something really rather sweet indeed. 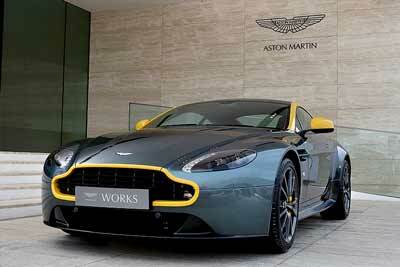 An even more focussed, special-edition Vantage, built to celebrate success on track. Future Aston Martin classic in waiting? In motorsport history one race stands out above all others as a maker of legends, the Le Mans 24 hour. 1959, Aston Martin had spent 10 long years trying to take the top step at Le Mans. They had come cruelly close but outright victory eluded them. The DBR1 was the car that ended that. Created as a replacement for the DB3S, the DBR1 first entered Le Mans in 1956 but retired after 246 laps. In 1957 Aston Martin entered two DBR1s, again both cars retired. In 1958 they entered three DBR1s and yet again all three cars retired. But in 1959, the car of Carroll Shelby and Roy Salvadori finally did it for Newport Pagnell, crossing the line after 24 hours in 1st place. What’s more the second car over the line was the DBR1/4 of Maurice Trintignant and Paul Frére. It didn’t end there as in 1859 Aston Martin also lifted the World Sportscar Championship crown. Aston Martin cars have raced at Le Mans over 100 times but (to date) have only tasted outright victory there only once with the DBR1. The Silver Birch Aston Martin DB5 is not only the most famous Aston Martin but probably the most famous car of all time (and inspired Dave Worrall’s 1993 book ‘The Most Famous Car in the World‘). The funny thing is, if it wasn’t for a certain fictional super spy, it may well not have been that way. 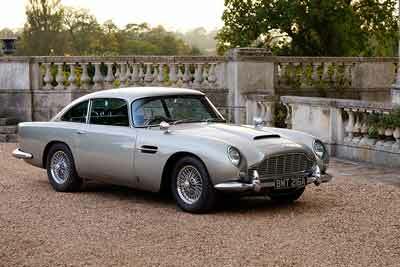 The car was very nearly called the DB4 series 6. Launched in 1963, the DB5 was an evolution of the DB4 series 5, sharing the cowled headlamps from the DB4 GT and with the same ‘Superleggera’ (super light) construction of Aluminium panels mounted on a tubular frame. The big changes were that the DB5 was 90mm longer, making it slightly bigger inside and the six-cylinder engine was increased to 4.0 litres, boosting power to 282bhp (314bhp in Vantage spec). Early cars were fitted with a four-speed manual transmission but this was quickly replaced by a much-improved ZF five-speed gearbox with synchromesh. After James Bond starred with a DB5 in Thunderball and Goldfinger, the DB5 and Aston Martin’s superstar status soared to such a level that more than fifty years later, the two are still inextricably linked. DB5 production only lasted for 2 years, with just over a 1000 models built. The DB5 was always an expensive car (at twice the price of a Jaguar E-Type when new) but today, superstar status and rarity sees the very best change hands at prices well over a million pounds. Do you agree with our top 5 Aston Martin cars? Which classic Aston Martin car would be your choice? Please let us know by commenting below.